If there is something that humans really dread, it can be said that it is disease that humans hate to suffer and endure. Of these diseases, some spread like fire in the form of epidemic outbreaks, going into unmanageable and uncontrollable proportions within a short span of time. By the time effective measures to curb the disease and its cause are in place, the epidemic takes a heavy toll on lives. 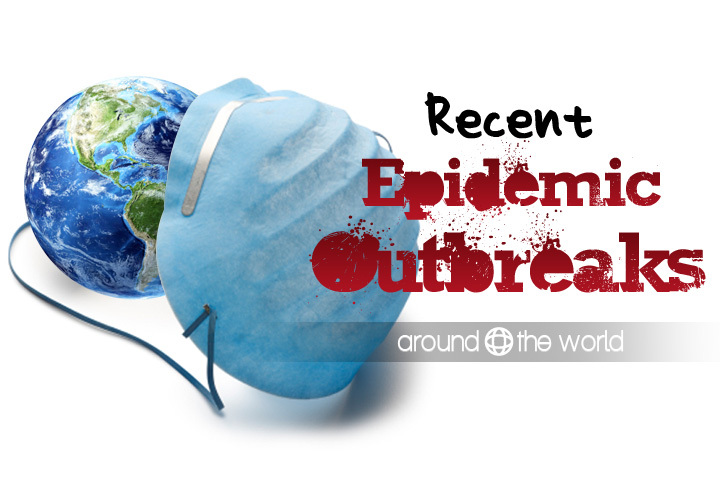 We list a few, including the deadly Ebola (EVD) that have broken out in recent times. Doctors and Epidemiologists around the world have been following the news of the recent outbreak of Ebola Virus Disease in West Africa, with grave concern, as this deadly disease has no known cure and can spread very rapidly. 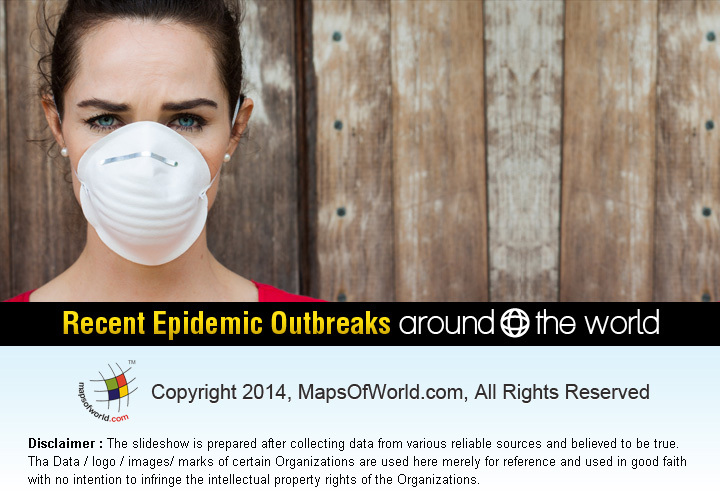 The recent outbreak began in February 2014 in Guinea, Sierra Leone, and Liberia in West Africa. As per the World Health Organization (WHO) report, by July 6, a total of 844 cases and 518 deaths have been reported by health ministries in Guinea, Sierra Leone, and Liberia since the epidemic began in February. Fatality rate thus stands at 61.37%. This is the highest death toll caused by an Ebola outbreak since an outbreak in Uganda in 2000-2001. 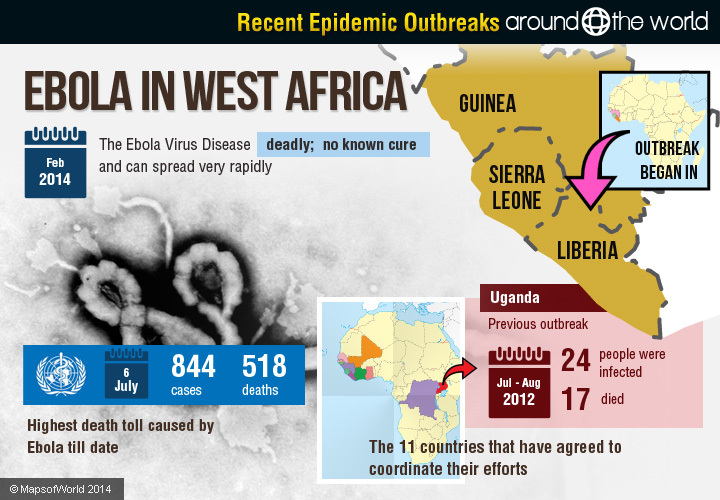 The last outbreak of Ebola was also in Uganda in 2012 July–August when 24 people were infected, of which 17 died. WHO had earlier reported that till 30th June, there have been 759 reported cases, with 467 reported deaths. Uganda has now imposed border restrictions and announced all travelers entering the borders of Uganda will be tested for Ebola. Ministers of 11 African countries met for 2 days in Ghana and agreed on a combined strategy to combat the killer disease on 3rd July. The 11 countries that have agreed to coordinate their efforts are: the Democratic Republic of the Congo, Gambia, Ghana, Guinea, Guinea-Bissau, Ivory Coast, Liberia, Mali, Senegal, Sierra Leone, and Uganda. Ebola Virus Disease, earlier known as Ebola Haemorrhagic Fever, is a severe illness (which is often fatal) in humans. 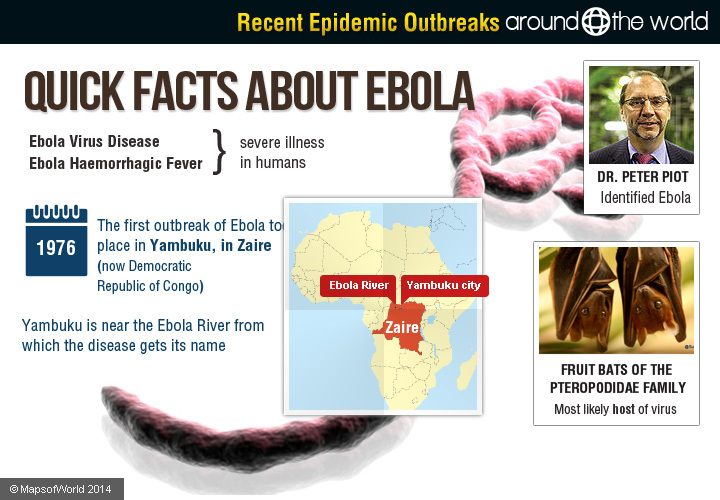 Ebola was identified by Dr. Peter Piot in the 1970s. The fatality rate for Ebola Virus Disease (EVD) can be as much as 90%, if medical care and hygienic precautions are not taken immediately. The first outbreak of Ebola took place in 1976 in Yambuku, in Zaire (Democratic Republic of Congo). Yambuku is near the Ebola River from which the disease gets its name. There was also an Ebola outbreak in 1976 in Sudan. 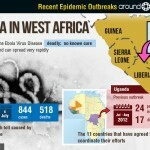 Most Ebola outbreaks have occurred in Central and West Africa, in areas where tropical rainforests are found. 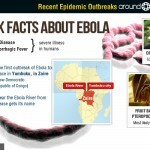 Scientists have identified Fruit Bats of the Pteropodidae family as the most likely natural host of the Ebola virus. Once an area is identified as a region suffering from an Ebola epidemic outbreak, medical restrictions are imposed and disease transmission prevention protocols have to be strictly followed. Since most of those affected by Ebola are young adults in the working population, Ebola outbreaks have a negative impact on the local economy in the short term. The longer-term impact of Ebola is felt through reduced tourism to the affected region as well as the imposition of trade restrictions on the movement of livestock, in some cases. 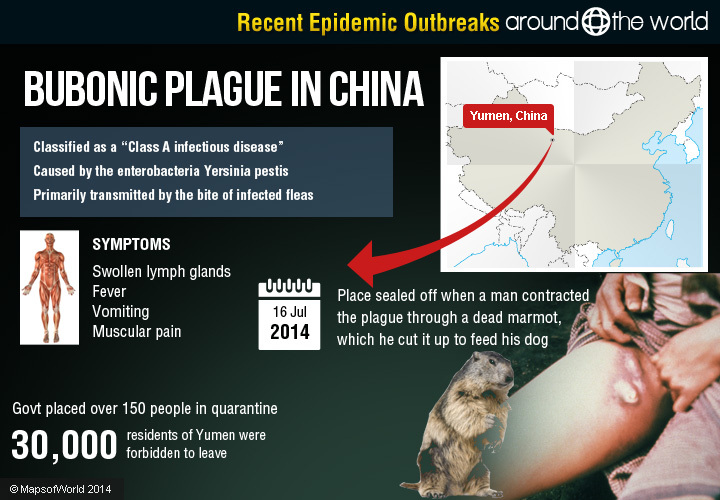 The Chinese town of Yumen in the northwestern province of Gansu had been sealed off as a protective measure by local authorities after a man died of Bubonic Plague on Wednesday, 16 July 2014. The man had found a dead marmot, a large furry rodent-like creature, and cut it up to feed his dog. However, he contracted Bubonic Plague, possibly from fleas on the dead marmot. He developed a high fever and was taken to hospital where his condition was diagnosed and he later succumbed to the disease. Bubonic plague, a highly infectious disease, is caused by the enterobacteria Yersinia pestis, and is primarily transmitted by the bite of infected fleas. Symptoms, include swollen lymph glands, fever, vomiting, and muscular pain. Plague can be treated by commonly available antibiotics, however, treatment needs to be prompt and measures need to be taken to isolate infected patients and prevent further transmission. 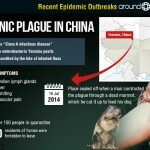 In China, Plague is classified as a “Class A infectious disease.” The Chinese government during that time placed more than 150 people in quarantine, and restricted the movement of people into and out of Yumen town. The 30,000 residents of Yumen were forbidden to leave. China Central Television (CCTV) broadcasted that no further cases were reported, and that the city has enough food supplies to last one month. In the mid-1800s, the last great epidemic of Bubonic plague that affected the world originated in China, and spread to other countries through rats on board merchant ships. 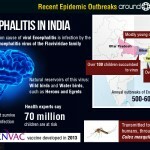 Parts of Eastern India are still reeling under a sudden spurt of Encephalitis cases. India’s Health Minister, Dr. Harsh Vardhan said that more than 100 children in Bihar state have succumbed to the virus this season. 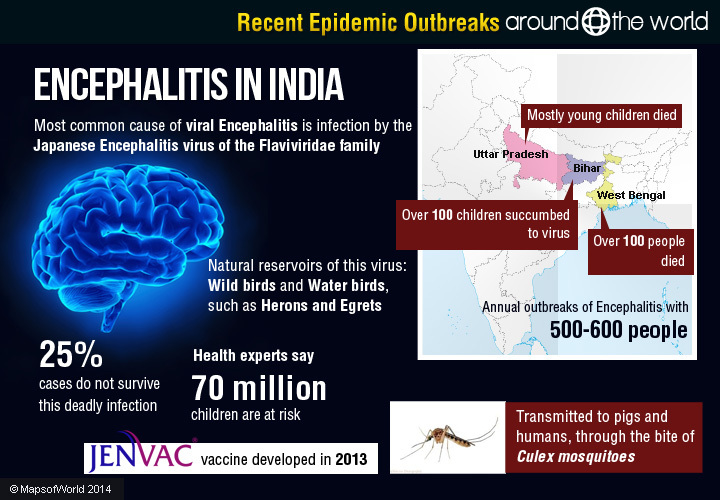 The most common cause of viral Encephalitis is infection by the Japanese Encephalitis virus. Japanese encephalitis is caused by viruses of the Flaviviridae family. The natural reservoirs of this virus are wild birds, including water birds such as Herons and Egrets. The virus is transmitted to pigs (another reservoir for the virus) and humans, through the bite of Culex mosquitoes. Symptoms of encephalitis, include fever, nausea, headache, infection of the membranes surrounding the brain, nerve damage, seizures, and unconsciousness. About 25% of cases do not survive this deadly infection. Health experts say 70 million children are at risk across India. Japanese Encephalitis can be prevented by vaccination and the use of mosquito control measures. India launched an indigenously developed vaccine, JENVAC, for Japanese Encephalitis in 2013. The Health Minister has announced “extraordinary steps” are to be taken to combat the disease, including vaccination, and separate hospital beds in districts worst affected by the disease. Japanese Encephalitis is found in most Asian countries, where it is endemic in the rainy season. It is also found in areas where flood irrigation is common. Over three billion people live in areas where Japanese Encephalitis is endemic. Middle East Respiratory Syndrome (MERS), a newly emerged viral disease, was first detected among travelers to the Middle East in 2012. Countries where MERS cases have been identified are: Lebanon, Jordan, Kuwait, Oman, Qatar, Saudi Arabia, the United Arab Emirates, and Yemen. 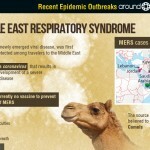 MERS is caused by a coronavirus that results in the rapid development of a severe respiratory disease. If a person already has an underlying respiratory condition, the disease is particularly severe. 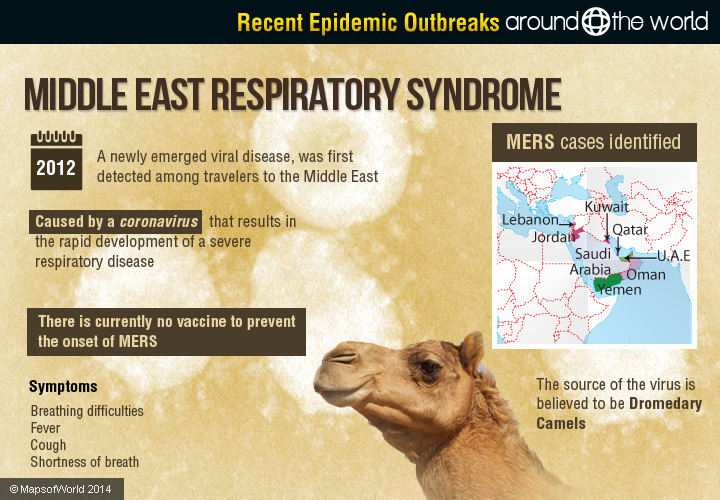 So far all those detected with MERS have either traveled to the Middle East or come into contact with people, who have been infected in the Middle East. Other countries to which travelers have returned and been detected with MERS, or where others have been subsequently infected, include: Egypt, France, Germany, Greece, Italy, Iran, the Philippines, Malaysia, the Netherlands, Tunisia, the United Kingdom, and the United States. There is currently no vaccine to prevent the onset of MERS. The source of the virus is believed to be Dromedary camels which are found in abundance in the Middle East. Symptoms of MERS include breathing difficulties, fever, cough, and shortness of breath. Other symptoms can be nausea, muscle pain, and diarrhoea. Severe cases can develop pneumonia. 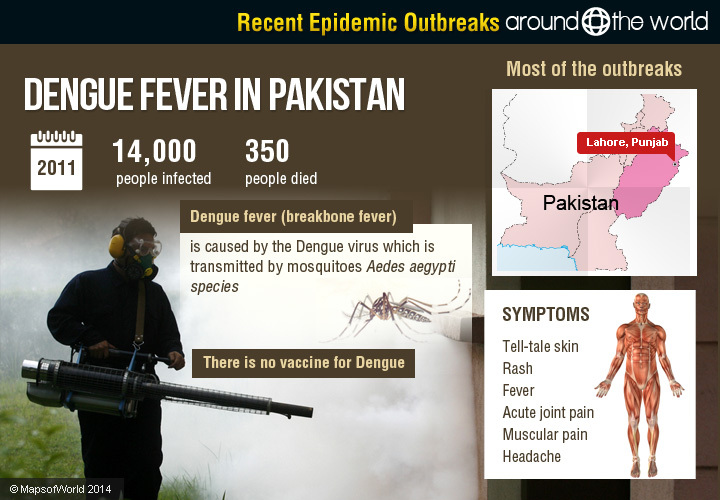 In Pakistan in 2011, over 14,000 people were infected with Dengue fever and over 350 people died due to this viral disease. 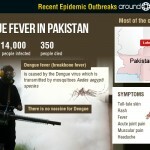 Most of the outbreaks were concentrated in and around Lahore, in Punjab province, in Pakistan. Dengue fever, also called breakbone fever, is caused by the Dengue virus which is transmitted by mosquitoes, primarily of the Aedes aegypti species. There have been at least a dozen major Dengue outbreaks around the world since the year 2000. There are 5 types of the Dengue virus, but an infection with one does not grant immunity to the others. There is no vaccine for Dengue. Health measures to prevent infection focus on fumigation, reducing stagnant water where the mosquito larvae are found, and distributing mosquito nets and mosquito repellents to prevent mosquito bites. The symptoms of Dengue include a tell-tale skin rash, fever, acute joint pain (hence the name breakbone fever), muscular pain, and headache. A more severe form is Dengue Hemorrhagic Fever (DHF), which involves internal bleeding and could result in Dengue Shock Syndrome (DSS) when a patient’s blood pressure drops to dangerously low levels. Patients are treated for dehydration through intravenous or oral means. Blood transfusion is required for acute cases of DHF or DSS. The Dengue epidemic continues till date in Pakistan, though the government and medical charities are fighting the disease with the support of international medical bodies. 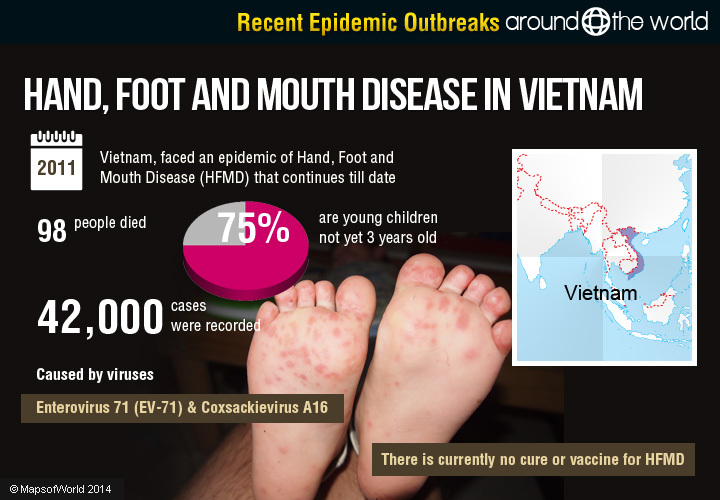 In 2011 the South-east Asian country of Vietnam, faced an epidemic of Hand, Foot and Mouth Disease (HFMD) that continues till date. As many as 98 people have died of which 75% are young children not yet 3 years old. Though the rampant infection has not been officially declared as an outbreak, medical records reveal that over 42,000 cases of HFMD were recorded. In related outbreaks in China during 2008-2010, many children were affected by this highly infectious disease, though accurate statistics for this are not known. Hand, Foot and Mouth Disease should not be confused with foot-and-mouth disease (also called hoof-and-mouth disease), which affects pigs, cattle and sheep. 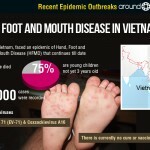 Hand, Foot and Mouth Disease is caused by viruses including Enterovirus 71 (EV-71) and Coxsackievirus A16. The symptoms of Hand, Foot and Mouth Disease include fever, and a rash that appears around the mouth, hands and feet. The virus usually has an incubation period of 3-6 days and usually also runs its course in 7–10 days. 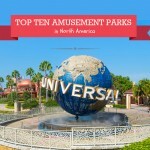 It is extremely contagious and is spread through direct contact with an infected person. Hand, Foot and Mouth Disease is most common among children who are less than 10 years old, though it can also occur among adults where the rash can be very painful. HFMD epidemics often occur in nursery schools. There is currently no cure or vaccine for HFMD, though one is being developed. Standard health precautions and supportive medical treatment can help a patient to recover. The outbreak of Cholera is the most severe epidemic of the disease in recent times. 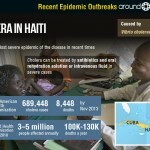 After Haiti was affected by a major earthquake in 2010, the breakdown of infrastructure and collapse of civic services resulted in an outbreak of cholera in mid-October. 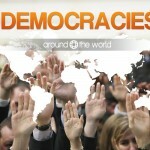 The disease also spread beyond Haiti to nearby countries such as Dominican Republic and Cuba. According to the Pan American Health Organization, there were 689,448 cholera cases in Haiti, leading to 8,448 deaths, by November 2013. 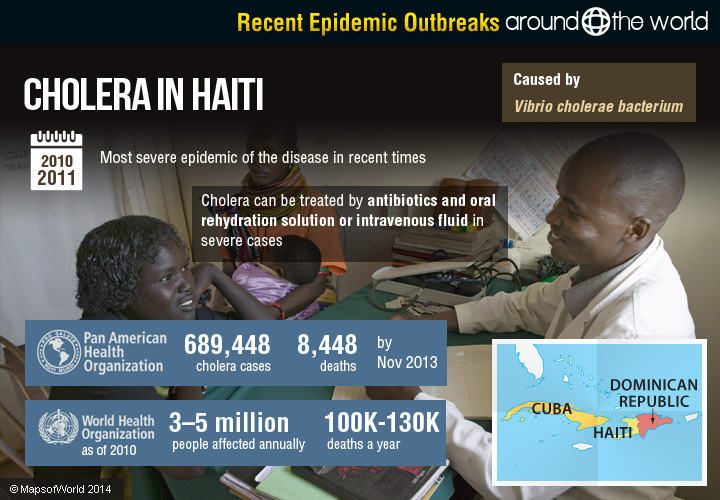 Cholera is caused by the Vibrio cholerae bacterium. The infection during this outbreak was caused by a new strain of Vibrio cholera, called El Tor. The bacteria causes an infection of the small intestine and its primary symptoms are vomiting and diarrhoea, leading to dehydration. Cholera is mainly transmitted through contaminated food and water. A person who displays no symptoms of cholera can be a carrier of the disease. Cholera can be treated by antibiotics and oral rehydration solution or intravenous fluid in severe cases. According to the WHO, as of 2010, Cholera affects 3–5 million people annually and causes 100,000–130,000 deaths a year. The year 2009-2010 witnessed a global flu pandemic as a new versions of the H1N1 influenza virus emerged and affected people worldwide. This was the second global flu pandemic after 1918. A combination of bird flu, swine flu, and human flu viruses combined with a European Pig Flu virus led to the disease being known as Swine Flu. 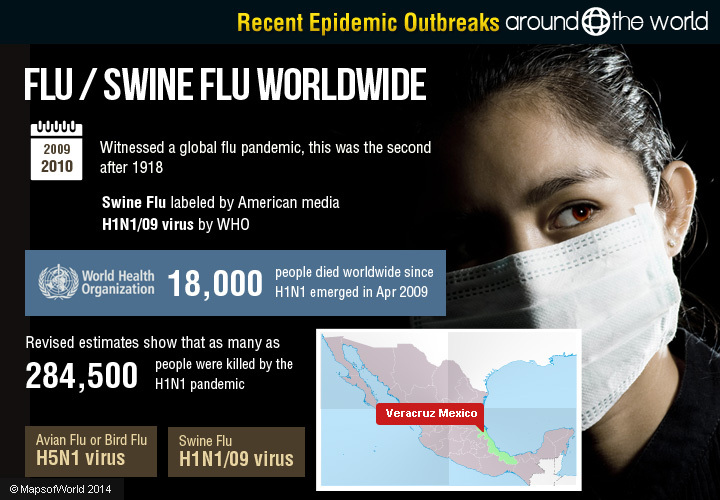 Swine Flu originally emerged in Veracruz Mexico, where it took several months before civic authorities acted to prevent further spread of the disease. It rapidly spread globally and by mid-April 2009 the WHO declared its first ever “public health emergency of international concern”. 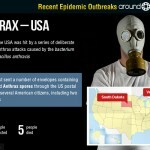 Subsequently in June 2009, both the WHO and the US Centers for Disease Control stopped recording count of new cases and the outbreak was declared a pandemic. 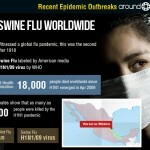 The disease was labeled Swine Flu by the American media, whereas the WHO refers to it as pandemic H1N1/09 virus. The symptoms of Swine Flu include respiratory difficulty, cough, cold, fever, body ache, and weakness. This could result in pneumonia of either a viral or bacterial nature. The treatment of Swine Flu is by antiviral drugs such as Zanamivir and Oseltamivir, as well as following basic health precautions, eating a nutritious diet, and getting sufficient rest and fluids. The H1N1 pandemic was declared ended on 10 August 2010 by the then Director-General of the WHO, Margaret Chan. 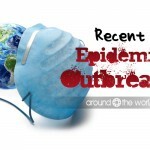 According to the WHO, more than 18,000 people died worldwide since H1N1 emerged in April 2009. However, other research has shown that the global death toll was much higher since many cases were unreported, particularly in Asia. Revised estimates show that as many as 284,500 people were killed by the H1N1 pandemic. The media often conflates Bird Flu and Swine Flu, however they are caused by different viruses. The H5N1 virus has been identified as the primary cause of Avian Flu or Bird Flu. While it has affected millions of birds, the number of human fatalities due to Bird Flu is 359 till date, according to the WHO. A new virus subtype called H7N9 has recently caused concern as it has a higher rate of infection and fatalities among humans. Avian Flu has severe economic consequences as poultry has to be culled to prevent the spread of the disease. Import bans by various countries, reduced consumption of poultry products and loss of public confidence in the practices of the poultry industry are other consequences of the Bird Flu scare. 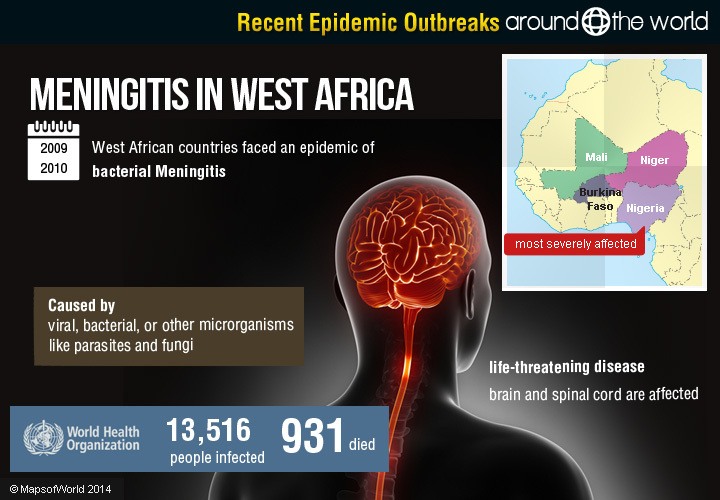 The West African countries of Nigeria, Niger, Mali, and Burkina Faso faced an epidemic of bacterial Meningitis from 2009 to 2010. 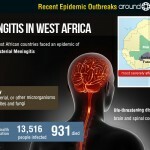 According to the WHO as many as 13,516 people were infected with Meningitis, of which 931 people died. The country most severely affected was Nigeria with more than half the total cases and deaths taking place there. This was the worst epidemic of Meningitis in West Africa since 1996 and as much as one-third of the world’s reserve of bacterial Meningitis vaccines were used in combating the disease. Meningitis is a severe inflammation of the membranes protecting the brain. These membranes are called the Meninges. The causes of Meningitis can be viral, bacterial, or other microrganisms like parasites and fungi. Because the brain and spinal cord are affected, Meningitis is a life-threatening disease. It can also cause deafness, cognitive impairment, and epilepsy. The most commonly seen symptoms of Meningitis are stiffness of the head and neck, fever, vomiting, being unable to tolerate bright light or loud noises, and mental confusion. Meningitis can be treated with antibiotics and antiviral drugs depending on whether the cause is bacterial or viral in origin. If left untreated, bacterial Meningitis is usually fatal. Newborn children and adults are most at-risk from this disease. 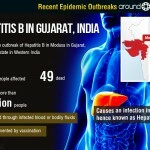 In early 2009, there was an outbreak of Hepatitis B in Modasa in Gujarat, a state in Western India. The infection affected more than 125 people of which 49 people succumbed to the disease. The re-use of infected syringes by some doctors was identified as one of the causes of the epidemic and several doctors were arrested following an investigation after the outbreak was stemmed. 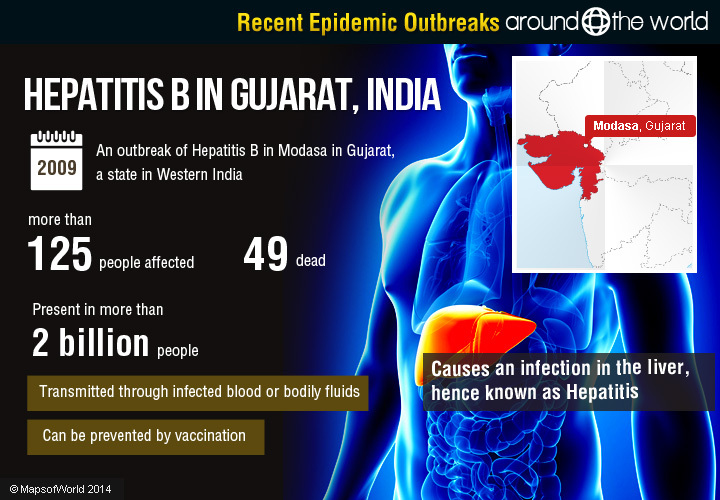 Once the disease was identified, the Gujarat government started a campaign of mass immunization with 600,000 doses of the Hepatitis B vaccine sent to the area and administered through a network of 60 booths that were set up in Modasa and nearby towns. Hepatitis B is a virus that causes an infection in the liver, hence it is known as Hepatitis. The Hepatitis B virus is present in more than 2 billion people or one-third of the world’s population. Hepatitis B is highly contagious and is transmitted through infected blood or bodily fluids. Transmission can be due to the use of infected syringes, from mother to child during childbirth, through sexual contact, and infected blood transfusions. The symptoms of Hepatitis B are jaundice, vomiting, and liver inflammation. Hepatitis B can be prevented by vaccination. 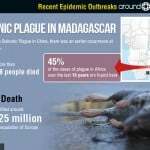 Bubonic Plague, one of the world’s most feared diseases had almost disappeared from Madagascar, an island country off the south-east coast of Africa after the 1930s. 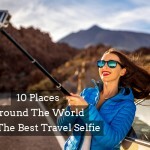 However, with increased deforestation and growing rodent populations in the cities, Bubonic Plague has seen a resurgence on this island in recent years. 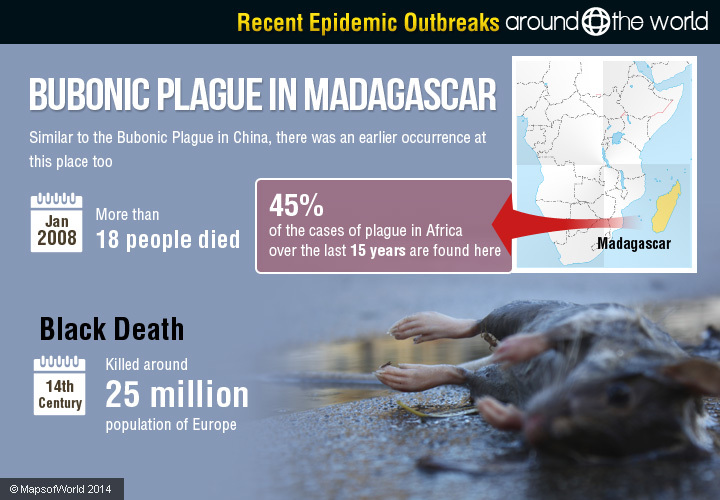 In January 2008, more than 18 people died due to bubonic plague in Madagascar. From 1995 to 1998, there were annual outbreaks of plague in Mahajanga, in Madagascar. Madagascar alone has accounted for 45% of the cases of plague in Africa over the last 15 years. This deadly disease killed around 25 million population of Europe in the 14th century in an epidemic called the Black Death. Originating in Africa and with a name derived from the Makonde word for “that which bends up” Chikungunya is now widely prevalent in many parts of the world. India suffered a major outbreak of Chikungunya in 2006, when the states of Andhra Pradesh, Andaman & Nicobar Islands, Tamil Nadu, Karnataka, Maharashtra, Gujarat, Madhya Pradesh, Kerala, and Delhi registered higher than average numbers of people infected with this disease. It occurred almost 32 years after the last reported epidemic of Chikungunya in Maharashtra in 1973. Suspected cases of over 1.25 million have been registered from the country, out of which 258,998 cases were from Maharashtra provinces and 752,245 from Karnataka. Chikungunya is characterized by high fever, rash, and a subsequent period of joint pain. The incubation period can lasts from 2-12 days. And, this painful phase of joint pain may persist for months. Chikungunya in transmitted by mosquitoes of the Aedes aegypti species. However, new research shows the virus has modified and is also capable of being transmitted by the Asian tiger mosquito. The best way to prevent infection is by using insecticides at potential mosquito breeding sites, and use of mosquito nets. Medication to bring down fever, rest, and fluids are the recommended treatment for people infected with Chikungunya. In 2005, 12 African countries reported 206,000 cases of Yellow Fever and 52,000 deaths. These countries were Benin, Burkina Faso, Cameroon, Ivory Coast, Ghana, Guinea, Liberia, Mali, Nigeria, Senegal, Sierra Leone, and Togo. 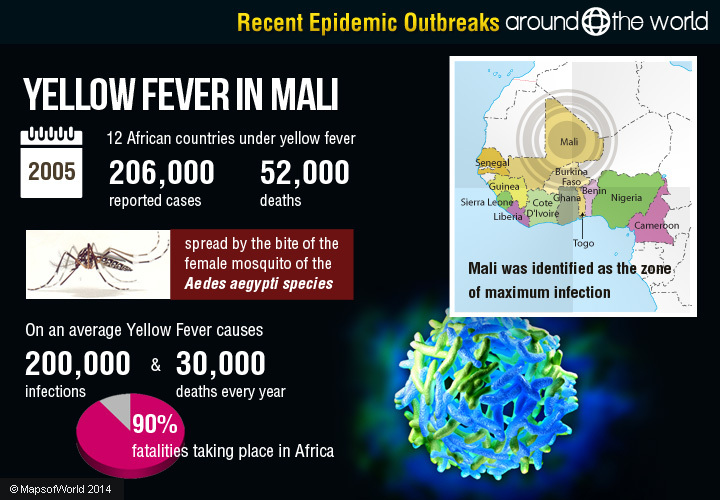 Mali was identified as the zone of maximum infection. Yellow Fever, is an infectious viral disease caused by the Yellow Fever Virus. It is spread by the bite of the female mosquito of the Aedes aegypti species. The Yellow Fever Virus is part of the Flavivirus genus of viruses. Symptoms of Yellow Fever are fever, nausea, muscle pain, loss of appetite, and shivering. More acute cases can result in jaundice (hence the name yellow fever) and liver damage. 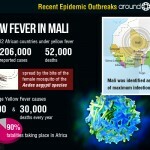 There is no cure for Yellow Fever, though there is a preventive vaccine. 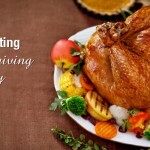 An otherwise healthy person, who is infected can overcome the disease within five days. 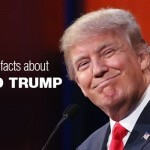 However, in 15% of the cases a more toxic form of the disease is seen. 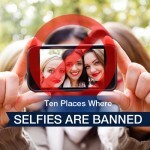 In severe epidemics more than 50% of the cases may die from this disease. Once a person overcomes Yellow Fever, they gain lifelong immunity from the disease. On an average Yellow Fever causes 200,000 infections and 30,000 deaths every year with almost 90% of these fatalities taking place in Africa. The WHO estimates that between 2006 and 2050, between 1.5 and 2.7 million people can succumb to Yellow Fever epidemics if no preventive vaccination programs are carried out. However, a vaccination campaign is running in several districts like Kadiolo, Yanfolia, Bafoulabé, Kolondiéba, and Sélingué where 300,000 people have been vaccinated. 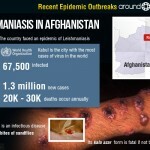 Epidemics are one among many challenges faced by Afghanistan. In 2004, the country faced an epidemic of Leishmaniasis. 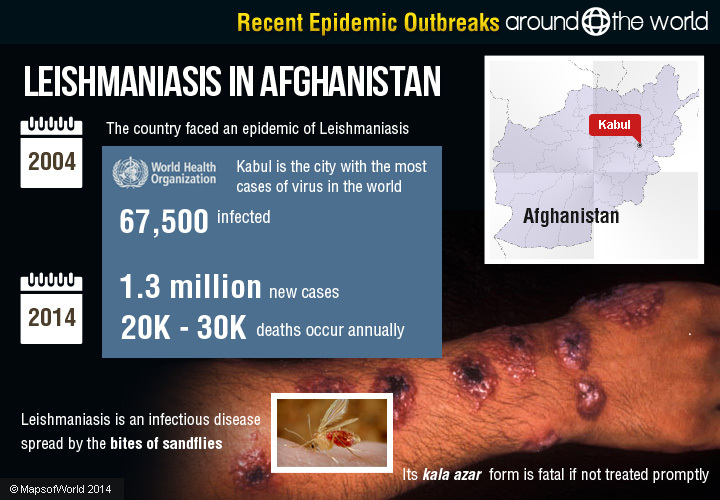 According to WHO estimates, Kabul – the capital of Afghanistan – is the city with the most cases of Cutaneous Leishmaniasis in the world, with about 67,500 people infected with the disease in 2004. According to the WHO, around 12 million people are currently infected with Leishmaniasis in 98 countries around the world. Also, as per January 2014 WHO report, an estimated 1.3 million new cases and 20,000 to 30,000 deaths occur annually due to Leishmaniasis. Leishmaniasis is an infectious disease spread by the bites of sandflies. The disease is caused by more than 20 species of microscopic parasites of the genus Leishmania. There are three main forms of the disease – Cutaneous Leishmaniasis, where the patient suffers from skin ulcers, Mucocutaneous Leishmaniasis where the patient has ulcers around the mouth and nose, as well as elsewhere on the skin, and the most severe form, Visceral Leishmaniasis that begins with skin ulcers and develops into fever, a reduced red blood cell count, and an enlarged liver and spleen. This last form (also called kala azar) is fatal if not treated promptly. Leishmaniasis is prevalent in less developed countries where deforestation and urbanization along with poverty and malnutrition make a deadly combination. Preventive measures include insecticides, using nets while sleeping, and medical treatment. 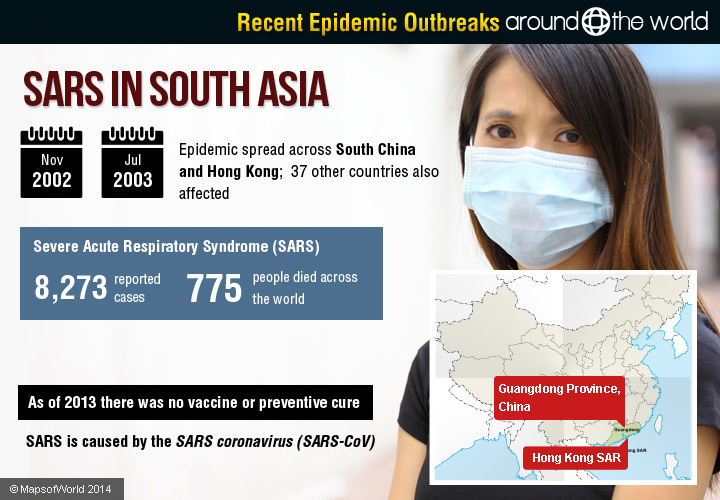 From November 2002 and July 2003, a new epidemic spread across South China and Hong Kong. 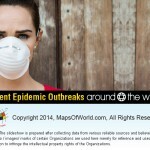 The disease quickly spread to 37 other countries and cases of SARS were reported from around the world. This epidemic started in Guangdong Province, China in November 2002. Called severe acute respiratory syndrome (SARS), it is a disease that affects the respiratory system. It is of particular concern because of the rapidity with which the disease can spread and the severity of the symptoms, which can be fatal if not detected and treated early. 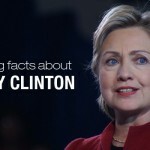 Medical records show that during this time period there were 8,273 cases of SARS of which 775 people died across the world with China having 5,328 number of cases and Hong Kong with 1,755 cases. SARS is caused by the SARS coronavirus (SARS-CoV). Symptoms of SARS, include respiratory distress and fever. A person with SARS is infectious for up to 10 days after they are cured from the disease. As of 2013 there was no vaccine or preventive cure for SARS. Since SARS is a viral disease antibiotics are not effective. Treatment consists of general hygiene precautions, disinfecting commonly used surfaces, and wearing a face or surgical mask as preventive measure. In May 2003 researchers identified the SARS virus was present in Palm Civets, following which more than 10,000 of these animals were killed in Guangdong. However, the SARS virus has also been found in raccoon dogs, ferret badgers, cats, and bats in China. 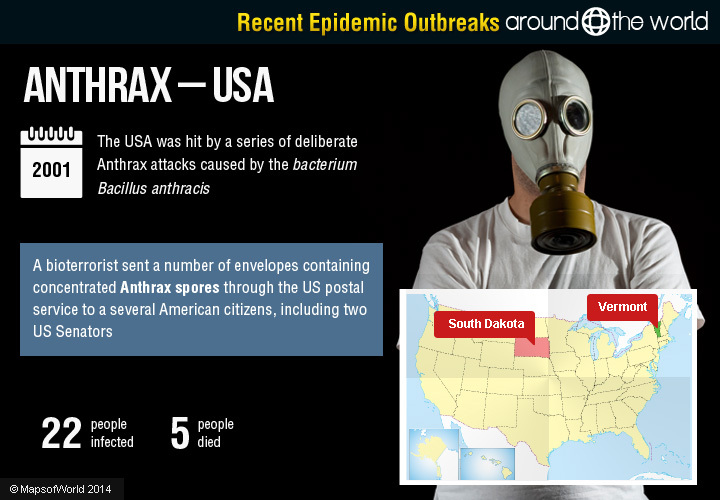 The USA was hit by a series of deliberate Anthrax attacks in 2001, when a bioterrorist sent a number of envelopes containing concentrated Anthrax spores through the US postal service to a several American citizens, including two US Senators. 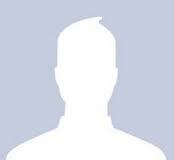 A total of 22 people were infected by the letters containing Anthrax spores, of which five died. 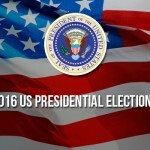 Letters were sent to the offices of then Democratic Senator Tom Daschle of South Dakota and then Democratic Senator Patrick Leahy of Vermont. Anthrax is an infectious disease caused by the bacterium Bacillus anthracis. It affects animals and humans. Most human cases are due to contact with an infected animal or other material contaminated with Anthrax spores. The bacterium that causes Anthrax can form an endospore, which can lie dormant and survive harsh weather conditions. 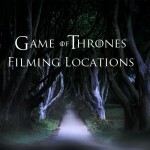 It can then revive when it comes into contact with a more hospitable host environment. Anthrax is most commonly found in countries where veterinary health systems are not well developed. A recent outbreak of Anthrax occurred in 2010 in the Cagayan Province of the Philippines, where local farmers ate an infected water buffalo. This resulted in more than 400 cases of illness and two deaths. There are now effective vaccines against Anthrax and the disease can also be treated by specific antibiotics. The possible use of Anthrax as a weapon for biological warfare was previously developed by many countries till the Convention on Prevention of Biological Warfare was signed on 10 April 1972. The 2001 episode of Anthrax used for bioterrorism in the US was investigated by the US Department of Justice and the US Postal Service had to put in place bio-hazard detection systems at its larger distribution centers in order to screen envelopes going through the postal system for Anthrax. The Journal of Medical Toxicology published the results of a scientific experiment by a high-school student which showed that an envelope could be successfully decontaminated if it contained any Anthrax spores if it was run over by a household iron at its highest setting (around 400°F).